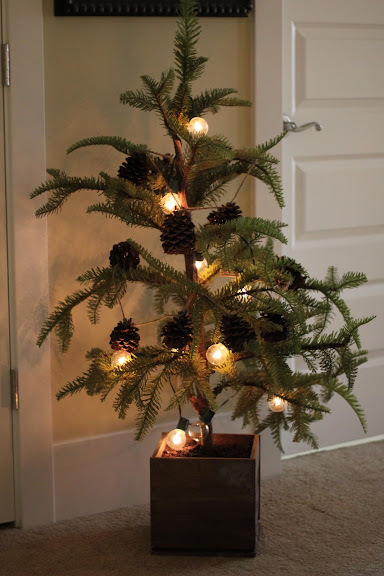 Tie the pinecones to the garland one by one, spacing them 5-6 inches apart. Making sure you double knot to secure. This part takes the most time since you have to bring your long twine through the knot, but it gets faster as you go along as the twine begins to get shorter and shorter. At the end make a loop and secure with a double knot like you did at the beginning. Get spray glue and glitter at the ready. Pinch both ends of twine together to avoid getting glue and glitter on the twine. Spray pine cone with spray glue, coat evenly. Do your best to spray down into the bowl. Sprinkle with glitter, allowing excess glitter to fall into the bowl (you can reuse this). After all pinecones have been glittered, allow to dry for 15-20 minutes. You can spray them with a sealing spray that you find at craft stores but this is optional. This little tree is my kids tree. Lily is begging me (as I type this) to pull the ornaments out so she can hang them on it. Thanks for stopping by today! Hope you're all enjoying getting into the holiday spirit! Cute bri! I love the big bulbs on the tree too! I love this! And it looks so cute on that little tree!